Whether your party is at the mercy of deadly rapids or is headed toward a plummet over a crushing waterfall, no Game Master wants to slow the action down by drawing every river bend and jagged rock. 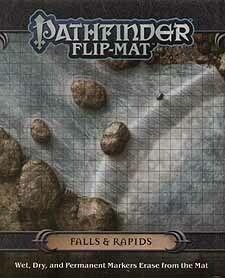 Fortunately, with Paizo Publishing's latest Pathfinder Flip-Mat, you don't have to! This line of gaming maps provides ready-to-use and captivatingly detailed fantasy set pieces for the busy Game Master. Whether the heroes are in flight or pursuit, this double-sided combat map features rapids, rocky bends, misty falls, and ambush spots aplenty! Don't waste your time sketching when you could be playing. With Pathfinder Flip-Mat: Falls & Rapids, you'll be ready next time your players find themselves up the river without a paddle!